Both the chemical and pharmaceutical industries are increasingly dependent on stereoselective synthetic methods and strategies for the generation of new chiral drugs and natural products that offer specific 3-D structures. With the publication of Stereoselective Synthesis of Drugs and Natural Products, researchers can turn to this comprehensive two-volume work to guide them through all the core methods for the synthesis of chiral drugs and natural products. 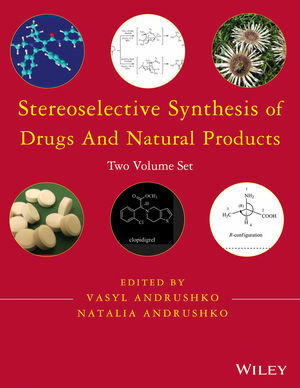 Stereoselective Synthesis of Drugs and Natural Products features contributions from an international team of synthetic chemists and pharmaceutical and natural product researchers. These authors have reviewed the tremendous body of literature in the field in order to compile a set of reliable, tested, and proven methods alongside step-by-step guidance. This practical resource not only explores synthetic methodology, but also reaction mechanisms and applications in medicinal chemistry and drug discovery. References in every chapter serve as a gateway to the literature in the field. With this publication as their guide, chemists involved in the stereoselective synthesis of drugs and natural products now have a single, expertly edited source for all the methods they need. Vasyl Andrushko is Research Scientist at Karlsruhe Institute of Technology where he researches in the areas of organic synthetic chemistry, asymmetric catalysis with application in stereoselective drug synthesis and as well as catalysis in alternative reaction media, organometallic chemistry, supramolecular and cluster chemistry. He has published 16 papers on topics directly related to stereoselective drug synthesis. Natalia Andrushko is a scientist at the Leibniz-Institute for Catalysis at the University of Rostock where she researches in the areas of organic and bioorganic chemistry, stereoselective synthesis of drugs and asymmetric catalysis. She has published 16 papers on topics directly related to stereoselective drug synthesis.